I'm running a little late this morning. Sweet Cheeks is home from school. Not because of the snow. He's not feeling well, and is a bit miserable with it, poor chap. I'm kinda glad he's home though, means we don't have to go out, we have quite a lot of the white stuff already, and more coming, thick and fast. Over at My Mum's Craft Shop, this week's theme is Lots of Layers, which had me worried for some weeks. I actually really enjoyed it when it came to it though. Love the layers on your card ! P.S. Hope sweet cheaks is feeling better!! Gorgeous, Faye! Love the texture and sweet layered hearts! This is stunning Faye. I love that image and those heart are gorgeous. Your card is gorgeous dear Faye; I love the sweet tall lady and the hearts together - great idea !!! Super card! Love everything about it and thinking what a great job you did with cutting her out.... she certainly has super slim legs (LOL). Hope your sweet cheeks is feeling better soon. Gorgeous uptown gal and I love all the distressing! Good luck with the kitty potty-training!!! 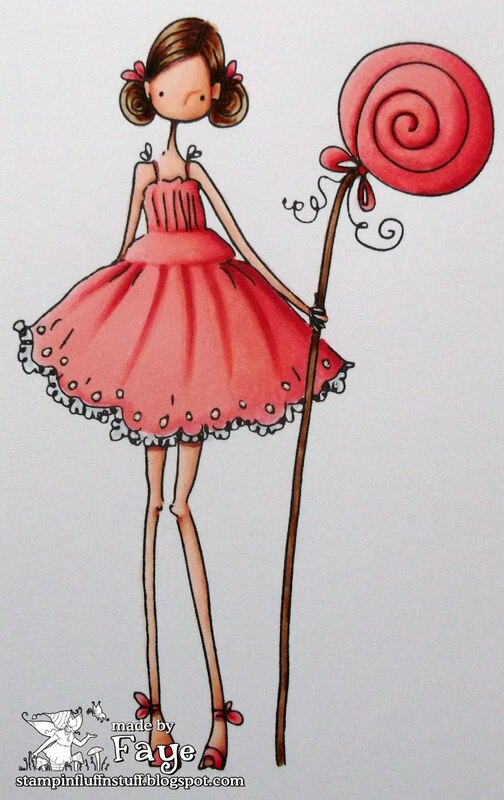 Nothing gives me greater joy in life than an image so obviously based on me & my skinny figure & shapely legs. Bravo you for showcasing me so well. Now...where's that pork pie? You've done a great job with the layering and the distressing of papers! A sweet and beautiful card! Hope sweet cheeks feel better soon Faye,love your gorgeous card!! What a great story about your cat! Your card is fab coloured...love the layout too! this is gorgeous...love the colour combo!! Must buy some of these stamps. Just noticed your watermark....that's pretty, looks like one of those Pollycraft images. Gorgeous card Faye. I love the image and fab colours, and the bunch of hearts looks great. Sooo gorgeous Faye! Love the image and the distressed/shabby chic look. Lol, at your cat story! oooooo so stunning faye.gorgeous pretty image and colours and i really love the layered hearts. i hope mr sweet cheeks is better soon. Hi Faye, still making fabulous cards I see! I really should get over here more often, then again no I shouldn't I'd just run off and buy all the stuff you use! PS - Your Boo and our Miss Miss T are definately a separated couple - she went in the bath when she first arrived as well!! Have also seen her squirting (if you get my drift) standing up against a tree, never seen a female cat do that before!!! Ahhh and 'im indoors does all the cat that end cleaning - I'm in charge of when they do something from the top end! And forgot to say, hope Sweet Cheeks gets better soon. Gorgeous card Faye and I love the vintage feel to the card! This is gorgeous Faye, I like the image, the hearts and the colours. oh i love this..those hearts are amazing...super cute image..
Where can I find these "Pink" and "Blue" lists? Is it standard???? I would have to draw the line at Purple though, they would always lean more toward Lavendar than Violet. Hope your little man is starting to feel better. One of the girls was home all week sick with it, too! 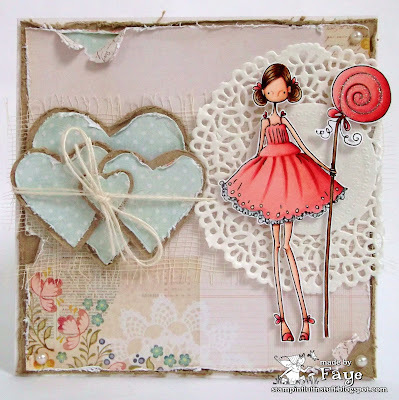 Gorgeous card Faye - love all the distressing and the hearts you created. Amazing peachy shade of pink - love the image and the doily!! Simply stunning! Perhaps you should keep a litter box in the house "just in case" hmmm? Anyways, great job with the uptown girl and did you enter this into the SCS challenge hmmm did ya? It would fit perfectly! Get out of here! That image is fabulous cut out! Love it! Pretty colors. The distressed hearts look great! How do you find the time to create all this gorgeousness!